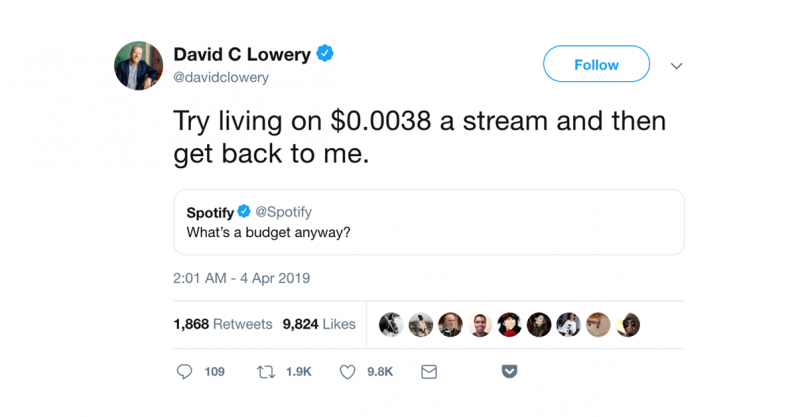 But as several users responded, Spotify should really think twice before mentioning budgets, considering the price artists’ pay for the company’s low prices. And one respondent in particular gave a very thorough, cutting tweetstorm about the topic. Lowery’s said in the past that he’s not against Spotify. He told Billboard, “Streaming is the future of the music business, and I’m not against it — I just want everyone to get paid fairly.” Even if you don’t necessarily agree with all his points, he’s worth listening to, if only to know why lots of people might not be cool with Spotify talking about budgets. We’ve reached out to Spotify to see if it has any response.